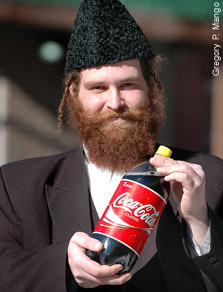 Rabbi Shishler online: Are you drinking Pesach Coke? Now, how do you like that? The only Coke that will be kosher for Pesach this year is being imported from Israel. And the ZAR has just dipped below R9,20 to the dollar. Let's only guess what that Coke is gonna cost. Of course, Pesach without Coke just wouldn't be the same, right? I can picture children of the future sitting at the Seder and saying "This Coke that we drink, for what reason? To remember the cool beverages that our forefathers drank in the desert heat to calm their digestive systems after eating bread that had baked on their backs for a week". For us Chabadniks, the fact that we couldn't arrange local Pesach Coke didn't rattle us. We only drink water, wine and hand-squeezed fruit juices anyway. Not everybody relates to our minimalist Pesach experience (no processed foods, bone-dry matzah witout avo or peanut butter), although if you've tatsed our Pesach menus, you'll agree the food tastes, well, real. We are not on a campaign to convert the whole community to have a spartan Pesach either. If Kosher LePesach cakes and chips help you enjoy the holiday more, by all means have them. We only need to stop and think about where to draw the line. Buying in some creature comforts to ease the Pesach process is great. Hiking up the overdraft to do it, not so much. Pesach is meant to be a unique family time when you congregate over dry matzos and too-sweet wine, as you share the "oldies" like Dayeinu while you revisit the well-traveled story of Exodus and anticipate the quirks of the family members who sit at your table each year. More importantly, Pesach is premier personal-development time. Pesach is when the small Israelite family was upgraded to the mighty Jewish nation; when the slaves of Egypt became the world's moral compass; when we were catapulted from lowliness to G-d's centre-stage. Pesach is not a past-tense holiday. All these journeys, escapes and spiritual catapults become available for us each year at this time. There really is nothing wrong with sipping on a קולה at the Seder table, even if it did cost you R20 a can. But the key is to ensure Pesach doesn't become all about that Coke instead of about its spiritual messages and opportunities.